Indy - Not only do their coach and QB not inspire the team with their wishy-washy leadership, but their fans don’t care that much either. After their showing yesterday, you would think the blogs would be a little harsher. San Diego - As a true believer that Walter Payton was the best all-around NFL RB ever, this guy is making me possibly re-think that. Jacksonville - I almost fell out of my chair when I heard this stat yesterday (look at this list for Taylor, Fred). How can this be? He almost single-handedly killed 3 separate fantasy teams for me, and now he is 21st all-time, passing Hall-of-Famers and about to go over 10,000 yards??!! Tennessee - Is it too early to bestow the greatest accolade known to football QB’s on to Vince Young? 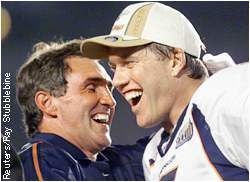 Denver - As much as I don’t like Plummer, I am starting to think maybe it wasn’t all his fault… Good thing Shanahan is a genius (seriously, how long is he going to be able to survive on that label and winning 2 SB’s with Elway and Davis). Chicago - And finally, let me steal a page from Kornheiser (boy, that is a phrase you just don’t say every day). I need a big day from Grossman to win my playoff game this week. Which Grossman will we see tonight - the stud of the early season, or the mass of suckitude of late?